Traditionally, the martial arts genre has a small but vibrant audience base consisting of genre devotees and Chinese American audiences. In both instances, these consumers had access to “grey market” home video releases (English subtitled Hong Kong DVD distributed) available through established online retailers a full 3 monthd prior to our theatrical release. The decision was made to provide a high-quality English language dubbed version of the film, coupled with aggressive what-pasting, stickering and stunt promotions to re-engage these audiences while reaching out to a broader general market fan base consisting of urban markets, gamers and eclectic cinema fans. Our decision on trailer was again predicated on a “broader radius” outreach. 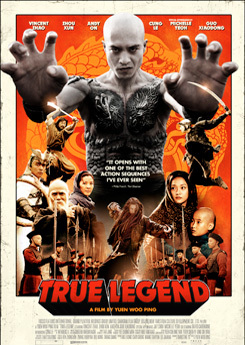 The stunning cinematography, together with the martial arts choreography of director Yuen Woo Ping where key. When co-star, Keith Carradine had passed away prior to distribution, trailer edits were quickly assembled to highlight his presence in what was to be his last film.Coupled with his newfound success via the Kill Bill films, trailers and other video clips were tagged and distributed. 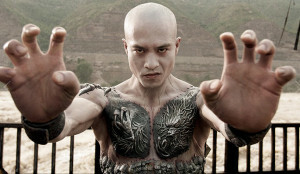 Producing an original music track and accompanying music video to market an Asian martial arts title for the US market was a radical departure. Harnessing recording industry relationships. The music talent of ( ) of famed industrial music pioneers Neitzer Ebb fame ( ) from Kraftwerk (write in), the track “Axis of Envy” was produced. We deviated from traditional Cantopop tracks entirely, opting for the techno-industrial music embraced by gamers, urban art circles, cyber-junkies and other alpha adopters and early influencers. Wheat pastings and stickering provided great visibility in key urban markets, where the genre is quite successful. With the support of our radio promotions agency, he “fist in your face” image worked its way onto skateboards, DJ bags, nightclubs and retailer walls. As exhibited in this YouTube video, Ninja-costumed B-boy (break dance) artist performed to amused crowds in key, high visibility markets. As seen here at the Grummans Chinese Theater in Hollywood, CA, there was ample viral media support as onlookers snapped and uploaded photos, received flyers and stickers for a truly “above the clutter” promotion.